Robbi and I are now back from our aromatic wanderings in Italy, Turkey, Bali and the lavender trails of Provence, where we witnessed the amazing spectacle and high energy of the Tour de France passing right through our tiny village. We are glad to be back in our cottage in Provincial south east Australia once again and are enjoying the awakening of spring with daffodils, newly opened leaves, flowering wattles and fruit trees in full blossom. It is strange to be staying in one place after almost four months of adventures but equally it is wonderful to have the time to reflect on the many delightful moments we shared with our Aroma Travellers this year. Our busy year will continue shortly but for the moment, home is the perfect place to be. One of the best ways to enjoy the spirit of our adventures is by taking a peek at a few of the 1000's of photos we have taken during our Aroma Tours' 2009 season. Thank you so very much for a delightful and enchanting week of adventure and discovery. There were so many heart warming moments that have created memories to last a lifetime. Everyday brought us laughter and joy filled moments, with scents of lavender, glorious food, tastes of olive oil, wonderful wines and much more." "The tour absolutely surpassed ALL my expectations. It was a true pleasure to stroll among the fields of lavender under your guidance. Merci, merci, merci!" "Thank you for putting together a wonderful tour. I have told so many people about it. It was so carefully planned to incorporate all one's senses: beautiful scenery, wonderful foods, spiritual music, perfume, and fun, compatible people. I will always remember it." "I hope you really enjoy your R&R- You totally earned it for creating such a spectacular trip for us. Every detail you thought of made it special and it had a plethora of touches that will provide great memories for years to come. It should never be called a "tour" since what you deliver is a remarkable and unique experience!" 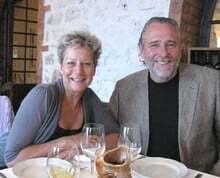 During our Heart of Provence Tour as we sat in yet another beautiful restaurant enjoying a long, leisurely lunch, our dear friend and driver this year Bill Bachman, came up with the amusing idea of "Survivor Provence". We all decided that if Provence was to be the "ordeal" to be endured, especially with such fine company, we were all ready to sign up! As our discussion continued Frank one of our guests from Rockville USA who was writing and producing a musical back in the states decided that "Survivor Provence" had to be presented as a musical. As fate would have it this year Provence was blessed with many musical moments for us to enjoy from the "Fete de la Musique", to wonderful jazz performances in the ruins of an old chateau, a big band concert in a beautiful winery, choral ensembles, blues and gypsy swing bands and a colourful traditional Provencale parade with dancers and folk music. At the end of our tour Frank wrote a lovely impromptu piece to the tune of Bob Hope's famous signature song "Thanks for the Memories" - thank you indeed! All is now well under way for next year's tour season and Robbi and I are thrilled to see the wonderful early response we are enjoying for all of our 2010 offerings. If you would like to join us next year or if you have any questions, please get in touch with us either by email at info@aroma-tours.com or by phone on: +61 3 5331 3254 (afternoon/evening USA time zones, mornings from other countries). This year's Provence Lavender Tour had the added bonus of allowing us to witness first hand the spectacle of The Tour de France. The afternoon before the tour arrived we journeyed in the late afternoon along the very route the cyclists would be taking - but in the reverse direction. All of the decorations were waving gaily and the roadway was a riot of colourful messages and artistic designs. As we drew closer to our village the roadway became lined for kilometre after kilometre with thousands of people all camping along the route ready to witness the passage of their heroes. The next day the excitement in the air was palpable and this normally quiet little village bustled with cycling enthusiasts from around the word; many dressed in lycra riding gear, reminiscent of a flock of multi-coloured tropical birds. Our hotel was perfectly positioned at the end of the route the cyclists would be taking into town and our Aroma Travellers had the option of either joining the throng lining the route or sitting in comfort in front of a huge picture window perched above the action with a perfect view of the cyclists' approach. There we were, poised like paparazzi as the parade of support cars, sponsor vehicles, motor cycles and police swept past us pre-empting the arrival of "Le Tour". The village felt like one organism intent on the Tours' approach and then as helicopters started swooping overhead every heart skipped a beat. There they were: Contador, Schleck, Armstrong and Wiggins, sweeping past with people cheering, arms waving and cameras flashing. This of course was only the appetizer and a hush fell, as every eye and ear strained for the first hint of the peloton's approach. Once again the helicopters spotted the game and with serpentine grace, the crush of riders glided past us. Now the tour swept through the lavender fields below us and on to a 21 kilometre hill climb on this penultimate day of the tour - tomorrow it was on to Paris and the finish. Tomorrow is another day and was far from our minds as we congregated in the local cafe owned by our friends Alain and Sandrine to watch the end of the stage on a huge TV screen with cool drink in hand. The superhuman strength and endurance of these men is beyond belief as they conquer the 1500 metre climb at an average speed of over 20 km/hr while back in our cafe we share the excitement and camaraderie of the gathered throng as the Tour de France 2009 imprints itself in the treasure chest of our fondest memories. Since we first started to explore the western Turkish coastline I have often wondered at the oddity of history that has left several Greek islands only a few kilometres from the Turkish coastline. Their nearest Greek neighbour - apart from a few barren rocks - is the island of Rhodes which is almost 4 hours away by boat! The islands are so close to Turkey that one year I was having trouble with my mobile phone and then realized that I had picked up the Greek mobile network and had to call local Turkish numbers as if from Greece. Happily in the last year or so access to Greece from Turkey has become much easier and when I discovered that it was possible to nip over the pond, I jumped at the chance and with five adventurous souls from our recent group we sailed in the late afternoon to our rendezvous with the mysterious island I had so often seen from afar. As we approached, a beautiful bay lined with colourful houses and several beautiful churches was revealed to us with water so clear it was almost totally transparent. Here the pace was noticeably slower and I immediately set off to explore ahead of the others, whereupon, in a side street I discovered a lovely small Greek orthodox church. The interior was quite austere but the air was positively thick� with burning Frankincense and at one end, there were six magnificent religious paintings that would find a place of honour in any Italian basilica. Back outside with my fellow travellers we sat overlooking fishing boats and the beautiful harbor eating delicious grilled calamari kebabs, freshest salad and a cool glass of white wine. On the return journey a full moon scintillated on the mill-pond smooth waters of the Mediterranean as we floated gently towards the Turkish shore, whose lights turned the waters before us into a golden carpet. These are the magic moments that come only rarely and show how important it is to "seize the moment." Our group this year was composed entirely of repeat Aroma Travellers, their spouses and friends. So right from our first meal together we had the pleasure of fine camaraderie. There were many delightful and delicious moments and it was our pleasure to share our love of the magnificent food, wine, culture and history of northern Italy with such lovely guests. Next year we look forward to another wonderful sojourn and we have some lovely new experiences to share with you. During our Provence tours this year we were able to give our guests the added bonus of experiencing some of the wonderful "Picasso in Provence" exhibitions that were being held to celebrate the years Picasso spent painting in southern France. After being exiled from Spain, he painted many of his masterpieces in Provence, was inspired by the beauty of the region and was influenced by the work of Cezanne. We saw over a hundred of his amazing works which we all greatly enjoyed and for myself as an aesthetic person but not an art buff as such, it was a revelation and a whole new unfolding of visual pleasure. Our Provence Aromatherapy Retreat next year will be focusing on skin care and wellbeing. We are very excited and delighted to announce that Mindy Green formerly of Aveda ( USA ) and Megan Larsen of Sodashi Skin Care ( Australia ) will be joining us in our tiny village amongst the lavender fields of the Haute Provence. This will undoubtedly be an awesome week of enhanced learning and practical applications. Topics covered include:- History of botanicals in skin care, essential oil chemo-types and their unique applications for skin, structure and function of the skin, ingredients for beautiful skin, 12 essential oils for effective skin care, Sodashi reflexology technique for the face, blending essential oils to personalise your products, diagnosis of skin types, carrier oils for different skin types, cleansing from the inside out, mature, ageing and sun damaged skin strategies, skin soothers, skin foods and micronutrients, stress diffusion for emotions relating to skin issues, relaxation techniques to calm the body/mind and soothe the skin. This was the 12th year of our Bali Women's Retreat and to share such a sacred, nourishing and nurturing week with a delightful group of fabulous women, was one of the highlights of my travels this year. I do believe that the synchronistic energies of people coming together to spend time with each other in the way we do is always significant. Each group weaves its own special magic in Bali and the desire of the beautiful women this year was to simply embrace all that we explored with a gentle ease. Our retreat week was heightened by a strong sense of connection, where we created a sacred space to openly share our collective gifts, to play joyfully and to honour the beauty that rests within each of us. Bali holds a very special place deep in the quiet of my heart and after living in Bali for a time in 1975 and now some 25 visits later, I never fail to be affected by the gentle spirit of the Balinese people and the beauty of this lush green paradise. Jim has created a page of memorable photos from our Bali adventures and I hope that you will enjoy sharing some of the beauty and serenity of Bali with me. 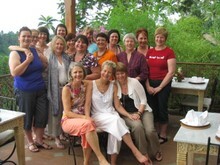 Bookings for the 2010 Bali Women's Retreat are already well underway with only 7 places left and we recommend that you get in touch with us shortly if you would like to join us next year. We are always exploring and looking for new experiences and beautiful places to share with our Aroma Travellers. This year's efforts discovered two lovely new hotels and several delightful restaurants that we consider perfect to add to next year's tour offerings. Our first discovery was in the Bouche du Rhone in a quiet setting with views of the Alpilles on the outskirts of a lovely market town. It has beautiful grounds and a wonderful sense of Provencale character with a lovely swimming pool, bar and lounges and a delightful 1 Michelin star gastronomic restaurant which we will enjoy during our stay. 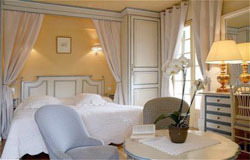 Our second hotel is a member of the Small Luxury Hotels group with delightful rooms and a fabulous garden which also hosts the hotel's fine restaurant. One of the nicest environments we have found with absolutely wonderful staff and a rich history of famous people who have enjoyed being their guests. Just the spot for us to enjoy, n'est pas. We look forward to sharing these lovely new hotels with our Aroma Travellers next year. This October Jim and I will be travelling to the USA where I will be speaking at the American Alliance of Aromatherapists Conference in Crystal Lakes IL ( near Chicago ). Jim will be travelling with me and we are both greatly looking forward to catching up with our many colleagues and friends in the USA as well as several of our past Aroma Travellers who live in the area. We are excited to announce that after the AIA Conference has finished I will be teaching a series of Aromatic Kinesiology Level One workshops. We will also be spending a few days in San Francisco around 3rd November and look forward to exploring more of the Pacific coast.